A small group of mushroom enthusiasts decided to have a festival to celebrate Kennett Square's number one cash crop with the hope of raising funds to give as scholarships to local high school students. 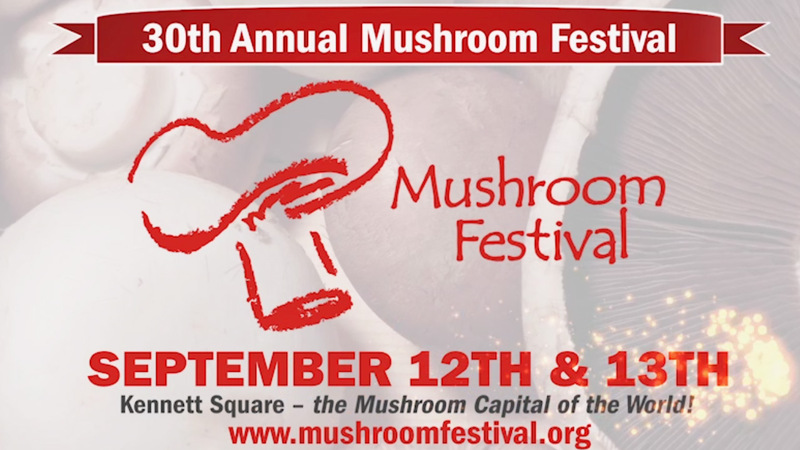 In 1986 that became a reality as Kennett Square hosted its first Mushroom Festival. It was a one day affair and just one block long. Thirty years later the Festival stretches a mile and features culinary events, growing exhibits, children's entertainment, and 200 vendors with attendance calculated at up to 100,000 guests. The Mushroom Festival's Grant Program has given $700,000 in grants to local non-profits since 2000. In 2015, 47 organizations received $80,000 in grants from the Mushroom Festival. Saturday, September 12, 2015: 10 a.m. to 7 p.m.
Sunday, September 13, 2015: 10 a.m. to 5 p.m.
Friday, September 11: 6 p.m. to 10 p.m.
Saturday, September 12: 3 p.m. to 10 p.m.
Sunday, September 13: 1 p.m. to 6 p.m. The Mushroom Festival is a rain or shine event. In severe weather some events may be canceled or rescheduled. Updates, when possible, will be made to the website. We love animals too, but ... please leave your pets at home. For the safety of your pet and others, pets are not allowed on the grounds of the Street Festival. Click here to browse the list of Frequently Asked Questions. You may find a quick answer to your question. $3 per person (ages 12 and up). Proceeds from the sale of the admission wristbands goes toward the Mushroom Festival's grant program. Last year the Mushroom Festival gave $80,000 to 47 non-profit organizations. Click here to learn more. Wristbands may be purchased in advance at The Mushroom Cap (114 West State Street, Kennett Square). Purchase wristbands the days of the event at the Mushroom Festival parking lots (while waiting for the shuttle buses) or at the 11 various entrances to the Festival. Kennett Square Borough is located off Route 1 in southern Chester County. Click here to learn more. For GPS directions use 101 South Union Street, Kennett Square PA 19348. During the Mushroom Festival many main roads are closed. Please follow posted detour signs. Expect delays in getting through town. Satellite parking lots with shuttle bus service to the Festival are available. Click here to learn more. There is limited street parking in Kennett Square during the Mushroom Festival. Finding a space can be difficult, which is why we recommend using the satellite parking lots. allHandicapped parking is available in the Genesis Parking garage at Linden Street and Union Street.